Last night in West Hartford was fun. I posted about this one at my main blog. 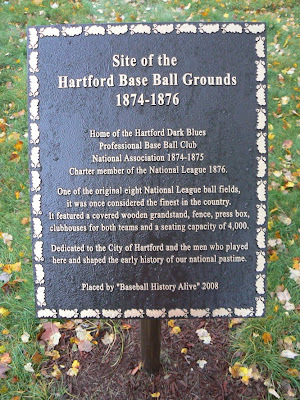 At our reading, I told people about where I'd just been--at the old home of the Dark Blues, Hartford's only major league baseball team, from back in '76. 1876, that is. We also had a great time doing Robin's radio show a few days back. I'll post the link to our interview when she puts it online. And we had fun on Diane & Ray on WTIC--Diane was there tonight and has been hyping our book on air, despite being a Yankee fan. Our next event will be another Connecticut one--details coming soon.